Mobil 1™ Extended Performance 0W-20 now available at many leading automotive retailers, mechanic shops and oil change centers. Mobil 1 lubricant engineers conducted a rigorous testing program to simulate stressful driving conditions for 210,000 miles. "At ExxonMobil, we’re continually working to advance the technology of our motor oils to meet the needs of modern engines and driving conditions, and Mobil 1 Extended Performance 0W-20 is a continuation of that commitment"
FAIRFAX, Va.--(BUSINESS WIRE)--Responding to an increasing number of automotive manufacturers recommending lower viscosity motor oils, ExxonMobil recently added SAE 0W-20 viscosity to its Mobil 1 Extended Performance product line. Like all Mobil 1 Extended Performance motor oils, Mobil 1 Extended Performance 0W-20 provides outstanding levels of performance, cleaning power and engine protection for up to 15,000 miles between oil changes*. 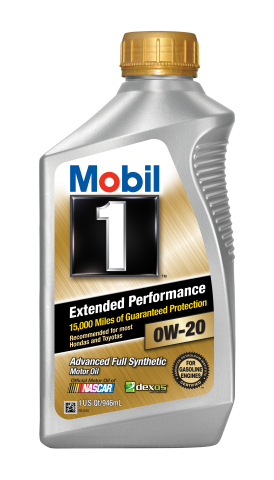 Mobil 1 Extended Performance 0W-20 is a proprietary blend of high performance synthetic basestocks with a balanced additive component system, designed to help deliver performance and protection during long service intervals. In fact, ExxonMobil backs all Mobil 1 Extended Performance motor oils with guaranteed protection of critical engine parts for up to 15,000 miles or one year, whichever comes first*. Mobil 1 Extended Performance synthetic motor oils are recommended by ExxonMobil for many types of modern vehicles, including high-performance turbo-charged gasoline and multi-valve fuel injected engines found in passenger cars, SUVs, light vans and trucks. Prior to launch, ExxonMobil engineers conducted extensive testing on Mobil 1 Extended Performance 0W-20 to ensure it could stand up to the most rigorous driving conditions. In one test, engineers operated a Toyota Camry and Honda Accord for 210,000 miles each in various driving conditions, including simulated highway, city and road trip driving, changing the oil every 15,000 miles. Mobil 1 Extended Performance 0W-20 synthetic motor oil meets or exceeds many top industry requirements, including General Motors dexos1™, ILSAC GF-5, API SN, SM, SL, SJ and Ford WSS-M2C947-A. 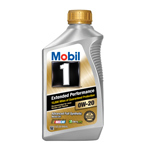 Mobil 1 Extended Performance is also available in SAE 5W-20, 5W-30, and 10W-30 viscosity grades. For more information about Mobil 1 Extended Performance 0W-20 and the other available viscosity grades, visit www.mobil1.com. The world's leading synthetic motor oil brand, Mobil 1 features anti-wear technology that provides performance beyond our conventional motor oils. This technology allows Mobil 1 to meet or exceed the toughest standards of car builders and to provide exceptional protection against engine wear, under normal or even some of the most extreme conditions. Mobil 1 flows quickly in extreme temperatures to protect critical engine parts and is designed to maximize engine performance and help extend engine life. For more information, visit mobil1.com and, on Facebook, www.facebook.com/mobil1. Mobil and Mobil 1 are registered trademarks of Exxon Mobil Corporation or one of its subsidiaries. *Please follow the recommendations in your owner's manual.